Use CustomizerGod. Windows 7 Task Pane Changer is obsolete, will no longer be updated and can cause problems. CustomizerGod is way more stable, fast and safe. Windows 7 Task Pane Changer is a freeware from door2windows that allows you to change your task pane in Windows 7 with one click. Run the tool as admin. Click Change Color Bitmap and browse for the color bitmap. If you don't have any, you can get some from here. 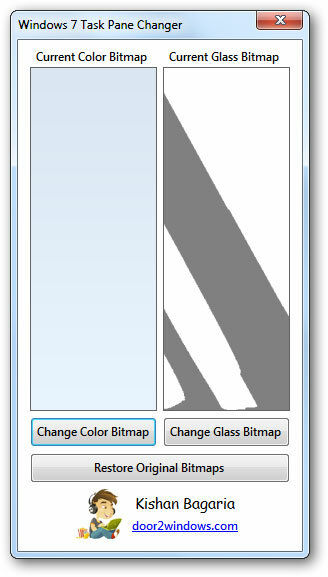 Click Change Glass Bitmap and browse for the glass bitmap. Now your computer will restart and the task pane will be changed. To restore it, click Restore Original Bitmaps.